A federal judge dealt a significant blow over the weekend to the ability of the Mashantucket Pequot and Mohegan tribal nations to jointly build a casino in East Windsor that would compete with MGM Resorts’ new casino in nearby Springfield. In a 58-page decision filed Saturday, Judge Rudolph Contreras of the U.S. District Court of the District of Columbia ruled that Connecticut and the Mashantucket Pequots have no legal standing to compel Department of the Interior Secretary Ryan Zinke to accept revisions to the state’s existing gambling agreement with the tribe. Connecticut’s authorization of the East Windsor casino in 2017 was contingent on Interior accepting the revisions as a means to guarantee the new project would not jeopardize the state’s current revenue sharing deal with the two tribal casinos, Foxwoods and Mohegan Sun. Without Zinke’s approval, the East Windsor project is blocked indefinitely. Contreras approved the federal government’s motion to dismiss the lawsuit by Connecticut and the tribe, and he granted MGM the right to intervene if the state and tribe appeal his decision. The tribes said they will continue to seek a way forward. With lobbying and litigation, MGM and the tribes have been fighting for years in Connecticut and Washington over casino expansion. The East Windsor casino, which would be the first in the state off tribal lands, was conceived by the tribes as a way to blunt the loss of market share to Springfield, just a dozen miles away. A revenue sharing deal struck in the early 1990s complicates any new gambling in the state. 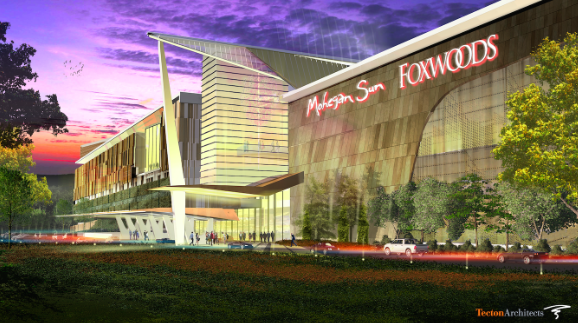 In return for 25 percent of the gross slots revenue at Foxwoods and Mohegan Sun, the state granted the tribal owners exclusive rights to all forms of casino gambling — meaning open competition for a new casino could cost the state millions. The revenue-sharing deal produced a high of $430 million for the state in 2007, but revenues dropped in the face of new competition in New York and Rhode Island to $270 million in 2017. With MGM Springfield opening in August and a second one under construction outside Boston, the slots revenue is projected to drop precipitously. Failing to bock the East Windsor authorization at the General Assembly, MGM has lobbied Interior, arguing that it has no obligation under IGRA, the Indian Gaming Regulatory Act, to facilitate a commercial casino off tribal lands, even if owned by federally recognized tribes. It was Connecticut that put Interior into the decision process, not IGRA, the federal government argued. “Because the Court concludes that the IGRA does not require the Secretary to take the steps asserted by Plaintiffs, the Court must consider Defendants’ argument that Plaintiffs have failed to state claims upon which relief may be granted,” the judge wrote. When Interior did not act on the revisions to the state’s gambling agreements with the two tribes, the state and tribes sued in the federal court. Members of the state’s congressional delegation also sought an investigation by the Inspector General about whether the department was improperly influenced by MGM. Interior seemed to relent in May, accepting revisions to the Mohegans’ gambling compact with Connecticut. “We are pleased that the department is taking this step and we expect similar action on the Mashantucket Pequot tribal amendments in the very near future,” Andrew Doba, a spokesman for the tribes’ joint venture, said at the time. But it turned out Interior had no such intent. For technical reasons, Interior had less discretion in dealing with the Mohegan revisions. The Mohegans conduct their gambling operations under a negotiated state-tribal compact. Revisions to those compacts must be accepted or rejected within strict time periods. But the Pequots, whose federal recognition came first, were unable to negotiate a compact with the state. Its deal with the state came after a federal lawsuit and was negotiated under the alternative terms using what are called “secretarial procedures.” The court said Interior is under no obligation to act on revisions to an agreement adopted vs secretarial procedures. Late last year, MGM created a new complication, striking a deal with a Bridgeport property owner to build a $650 million gambling resort on the city’s waterfront. The deal is contingent on the General Assembly opening Connecticut to casino competition, ending its exclusivity deal with the tribes. MGM says it could match or exceed the benefits of the tribal deal with a commercial casino.